Waitarere Beach is the pearl of the Horowhenua. A wonderful beach for walking, swimming, and relaxing. 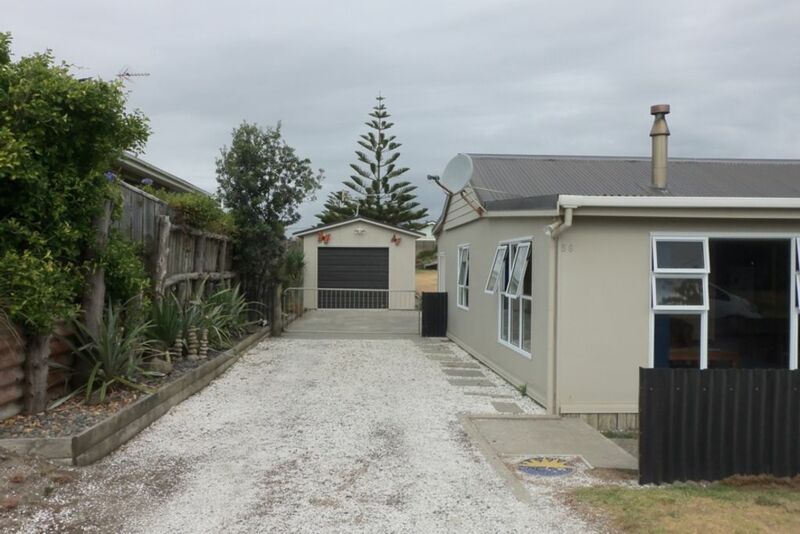 A fantastic little beach community with convenient 4 Square, restaurant, cafe, and takeaways. Walking or mountain-biking in the Waitarere Forest is an alternative way to unwind to walking along the beach watching the sunset. Levin is 15km away and a great place to shop and play, especially at the Aquatic Centre. Foxton is 18km, make sure you visit the Wind Mill. Otaki is only 35km away for that shop till you drop desire. Waitarere Beach is easily accessible from Wellington (109km), Palmerston North / Feilding (60km), and Wanganui (100km). Use it for a total holiday, or commute to work leaving the family at the beach. Our base tariff allows for a family group of 2 adults and up to 3 children under 16 years. AS FURTHER CLARIFICATION THE FAMILY GROUP USED FOR THE BASE TARIFF IS THAT OF THE RENTER. Additional persons are charged an extra ( adult and children the same Rate. Great place to stay just a 3 minute walk to the beach. I have stayed before and will stay again. This place has everything and is a great spot to unwind. Thank you so much to the owners for making this place available. It was great that you chose to return and enjoyed your stay. We hope to see you back again some time. We thoroughly enjoyed our stay with our family, including young grandchildren in the well designed Bach. The icing on the cake was the weather - 5 hot sunny windless days. The customer service was excellent - we had an issue with the waste disposal unit and within two hours of contacting the owners the unit was repaired. The cafe (excellent meal) and access to the beach were all within easy walking distance. We would recommend this property to any larger family group. Thanking you for the opportunity to stay at Happy haven definitely lives up to its name. So pleased you enjoyed your stay and all went well for your family gathering. You left the house spotless - thank you. Hope to see you back one day. This was our second visit to Happy Haven but this time we took the Great Uncle & Grandparents and utilised the sleepout for the teens. This bach is very well appointed and plenty of seating combinations inside and out for larger groups. Perfect weather and warm safe swimming waters a few meters away, was the icing on the cake. Thank you Lynne once again for having us. I am so pleased you enjoyed your stay and you were all accommodated comfortably. The weather was certainly a bonus for you. We would love to have you back any time. The house was so clean and tidy I wondered if anyone had actually stayed!! Thank you. That is great to hear. We are so pleased you enjoyed your stay and you are welcome back at any time. Lovey to have you back and you are welcome again any time. Lovely home that is family friendly and close to the beach. The home had everything we needed and had a very comfortable vibe. We enjoyed our stay and look forward to going back for another holiday in the future. That is lovely to hear. You are welcome to stay again any time. Thank you.